I needed a masculine card to give to my neighbor here in Florida, so I dug out my Art Impressions watercolor stamps and LePlume markers and gave it a go. My watercolors skills are a bit rusty since the last watercolor card I made was 5 years ago, but I think my neighbor will like this scene. i LOVE it! I need to pull out my Art Impression stamps too. I bought watercolor paper about 2 months ago. Can't find it....grrrrr You know I love anything nautical. PS....funny I posted something nautical too today. 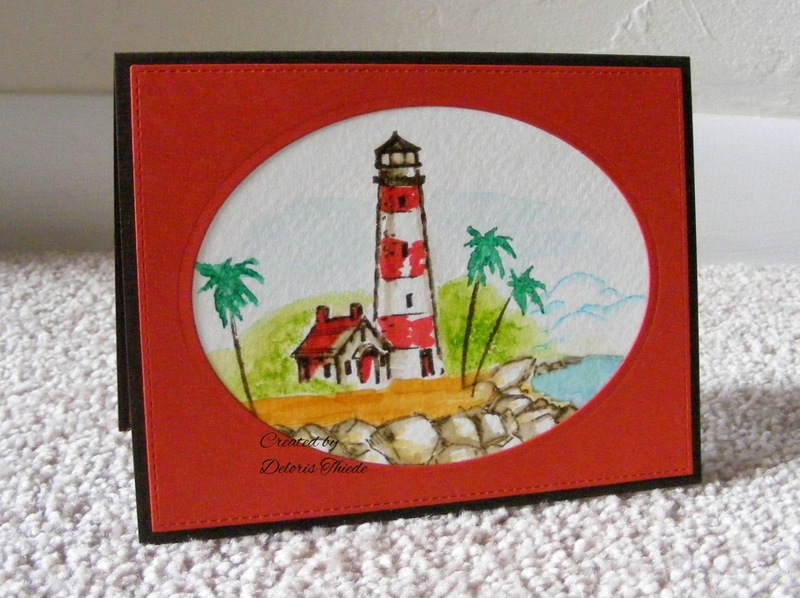 A fabulous card Deloris, such a beautifully coloured scene and lovely bold surround. Beautiful lighthouse scene. Have a wonderful day. Wonderful stamp love the coloring so soft and pretty. Thanks for playing our challenge at Lil Patch of Crafty Friends. Love the way you water colored this stamp. It has such a beachy feel to it.